This blog post comes from the desk of Senior Curator, Linda Jansma. Each year The Robert McLaughlin Gallery completely revamps the Isabel McLaughlin Gallery, a space that is dedicated to the RMG’s permanent collection. When I first came to the gallery, the norm was to give a slice of art history from a chronological perspective: 19th century landscapes and portraits were followed by the more experimental works by member of the Group of Seven. From there, a selection of works by artists of the Canadian Group of Painters, a group that was formed in 1933 and on to the 1950s and ending before abstract expressionism. It was a traditional way of showing things, but a little on the dull side. What would happen if an A.Y. Jackson landscape from the 1940s was placed beside a Rae Johnson landscape from the 1990s? A traditional Emily Carr landscape beside a wildly exuberant work by regional artist Lynn McIlvride? A large scale photograph by Montreal-based artist Holly King, beside a small still life by Arthur Lismer? Well, a lot more fun from a curatorial perspective and something that requires more work/thought from our audience! During the third week of August, we’ll install the exhibition Moving Image. It will include paintings of landscapes that show rushing water and clouds scuttling across the sky; the migration of both people and animals; works that are emotionally moving and create illusions of movement. Works will be historic and contemporary, include painting, drawing, sculpture and photography. A favourite of mine in this exhibition is a work called Flock from 2009 by Kingston-based artist Don Maynard. 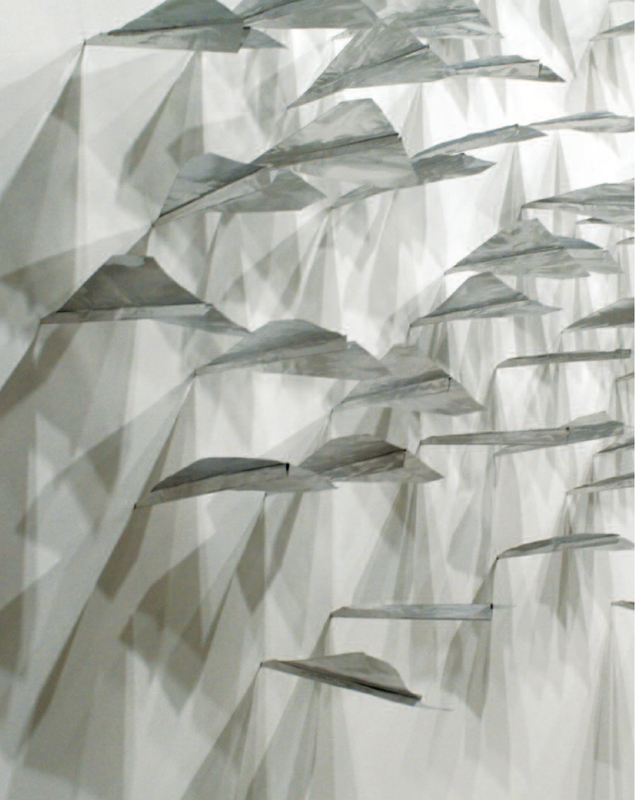 From a distance, the installation looks like a swooping flock of birds, but on closer examination, you see a number of traditional paper airplanes (made of thin aluminum rather than paper) with their noses embedded into the wall. When I saw the work in Don’s studio, my first thought was “what a great idea! !” I still think that, and I hope visitors to the gallery enjoy both it and the other works in Moving Image.